Have You or a Loved One Been a Victim of Jail Medical Neglect? 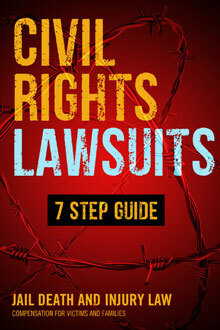 You Can Sue Jails or Prisons for Failure to Provide Medical Care. Failure to provide adequate medical care to inmates is negligent, and you have a right to sue for compensation. If you or a loved one needed medical care, didn´t receive it, and that led to harm or death, you can file a medical negligence or wrongful death claim. Our top-tier attorneys have filed dozens of lawsuits nationwide, maximizing compensation and contributing to policy changes. Prisoners and detainees of all kinds have a right to adequate medical care. You don´t lose that right when you go to jail. If a detention center fails to provide medical care and that leads to health complications, the government, negligent staff, and private health care providers servicing prisons can be liable. Addicts and alcoholics who are left to go through withdrawal without receiving medication or adequate care in jail have a right to sue. We focus on this type of case and a wide variety of jail medical neglect claims, from failure to provide prompt care during an emergency to negligence in protecting suicidal patients and inadequate care provided for mentally ill inmates. Our team of civil rights advocates and medical neglect specialists have represented victims of medical neglect at prisons, jails, immigration detention centers, and juvenile correctional facilities. Our seasoned investigators, medical experts, and litigators have developed proven strategies to uncover the truth, hold the culprits accountable, and maximize compensation. When Jails and Medical Contractors Put Profits Over Prisoners, Inmates Have Rights! Some prison medical contractors are especially vile, but US laws protect inmates, and sometimes justice is made. In 2016, a class action settlement of over $2 million in a case against the Florida Department of Corrections and its infamous former medical contractor, Corizon was a step in the right direction. The company Corizon had been routinely denying hernia surgeries to inmates who desperately needed them, with the sole purpose of saving costs! In some prisons, for example, one in Arizona in 2015, the average wait time for an inmate to see a doctor was 75 days. To see a nurse, an inmate had to wait 17 days. Not much has changed since then. The number of deaths connected with medical negligence in some US prisons is shocking. Getting sent to some particularly bad US prisons with the mildest medical condition can be synonymous with a death sentence. This is illegal and against US laws; inmates and families must be aware of their Constitutional rights. Our team of jail medical neglect attorneys can help protect your loved one before it is too late. Whenever there has been “deliberate indifference” in a case where an inmate presented “serious medical needs,” you can file an inmate medical neglect claim. Finding out what happened to an inmate who endured medical neglect in prison can be tough. There is much secrecy around jail medical neglect. Many state laws do not require jails to file an inmate death report unless the inmate has died inside the jail. In a recent North Carolina case, two inmates died at the hospital, only hours after being taken there from jail. In this case, there was no requirement for a report explaining how the prisoners had reached such a terrible medical condition. Many jail records are secret, because they enjoy an exemption from the Freedom of Information Act. In Virginia, for example, there is no state agency charged with reviewing inmate deaths. In the past, the authorities have found numerous legal loopholes to avoid taking responsibility for jail medical neglect. Our attorneys, in close collaboration with our team of inmate affairs investigators, have developed strategies to penetrate the jail system´s barrier of secrecy and find out exactly what happened and who was responsible. We specialize in maximizing compensation in cases of medical neglect, malpractice, and wrongful death in detention centers from Florida and California to Arizona, Texas, New York, Ohio, Illinois, and beyond. How Much Compensation Can I Get for Jail Medical Neglect? It really depends on the gravity of the medical neglect and the type of evidence our legal team can find. Lately, we have seen many large settlements all over the US. Often, these cases help further policy changes. On many occasions, prisons have switched medical contractors after a successful medical neglect lawsuit. In July 2017, Yamhill County agreed to pay $5 million to the family of Jed Hawk Myers, a Yamhill County Jail inmate. Myers died after he was assaulted by two inmates and taken to a medical cell where he was never seen by a doctor in spite of his agonizing cries for help. During his five hours in the medical cell, Myers urinated blood, endured excruciating pain, and pressed an intercom button 19 times, but no one answered. In December 2016, Deschutes County (Oregon) agreed to a $1 million settlement with the family of Edwin Mays III, an inmate who overdosed on meth and died in jail while deputies joked and mocked him, which was captured on video. Four deputies who appeared in the video were disciplined, including two supervisors, who were demoted. In early 2017, Correctional Medical Care agreed to pay $425,000 to the family of an inmate who died from opiate withdrawal at New York’s Schenectady County Jail. In late 2016, the estate of Nicole Carmen received a $300,000 settlement from Correctional Medical Care. Carmen had died after enduring heroin withdrawal symptoms with no medical attention for several days. She spent days covered in vomit and feces, one nurse who was summoned said she was “faking it,” and when she was finally taken to a medical facility, it was already too late. You Have a Limited Time to Sue for Jail Medical Neglect. Act Now! There is a statute of limitations for filing jail medical neglect claims. This means that you may only have one year, two years, three at best, depending on the state and some other factors. Our attorneys can help you establish which time frame applies to your particular case. But no matter what, DON´T WAIT. Jails, prisons, and medical contractors have many ways of covering up their medical neglect of inmates. The longer you wait, the colder the traces of wrongdoing will be. Whether you or your loved one have been injured, harmed, or even left to die, the longer you wait, the harder it will be to find any relevant evidence. Contact us today for a free consultation. Our attorneys are passionate civil rights advocates with a proven track record of success, who will always have you and your family´s best interest at heart. Inmates have rights. There are laws protecting them. If you or a loved one has been a victim, we can help.